Just the other day a woman who moved from Seattle to Nebraska back in 2005 came into the shop for the first time since our expansion 4 ½ years ago. Her eyes were big with wonder as she exclaimed, “It’s so BIG and BRIGHT!” Her excitement took me back to when I saw the newly expanded shop for the first time. It was a big and bright canvas and the possibilities were endless. And thanks to the magical skills of our buyers and creative and enthusiastic staff, the possibilities remain endless. Bright would be my favorite adjective to describe the shop downtown. Colorful is another great descriptor. Bright and colorful is exactly what a shop needs to be in the often cloudy rainy days of downtown Seattle. What helps keep the shop so bright and colorful is the glass wall. Seven rows of backlit glass shelves that make me want to take every single item on display home with me. 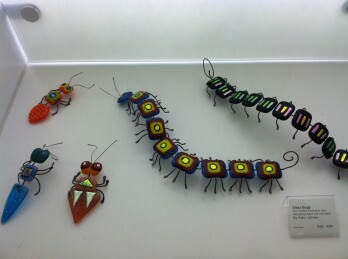 I have never loved bugs as much as I love the glass bugs we have by Newport, Oregon Artist Katie Lareau. 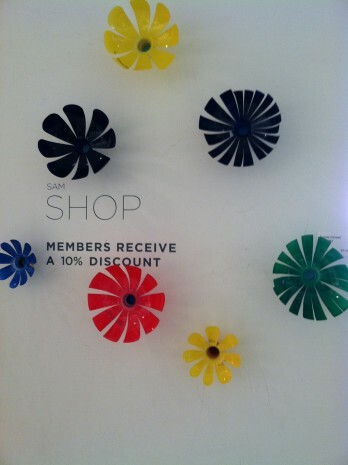 SAM Shop is inspired by the museum. That is to say that our buyer often has our exhibitions in mind when choosing what to have in the shop. This means things are always changing. 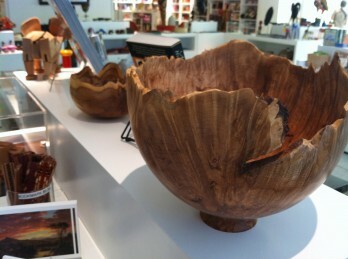 For example, for the Beauty & Bounty exhibition, we have some of the most beautiful wood bowls I’ve seen, created by local wood carver Roger Dunn. 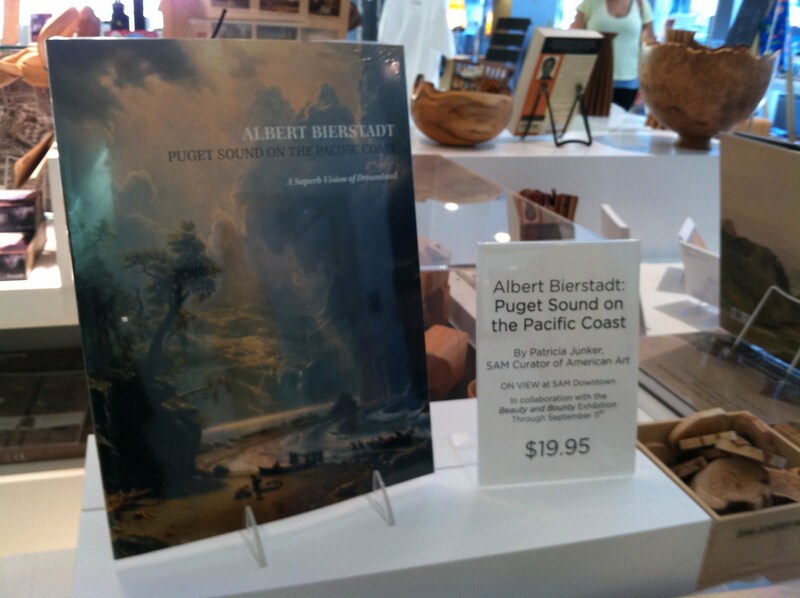 As a big Albert Bierstadt fan, I am thrilled about Albert Bierstadt: Puget Sound on the Pacific Coast written by our very own Patti Junker. It has been far too long since a book has been written about this man, not to mention giving one of the most beautiful paintings in our collection some well deserved attention. Rather than a traditional exhibition catalogue, SAM’s “Beauty & Bounty” show will be accompanied by a book that outlines new research from Seattle Art Museum curator Patricia Junker. We also get our inspiration from our permanent collection. Our Northwest Native masks and carvings make me wish I had more wall space, not to mention the African masks we carry. They are magical to say the very least. The one place I have a hard time resisting is our jewelry cases. We have some of the most beautiful and creative jewelry I’ve seen in any shop in Seattle. What’s more incredible is that about 80-85% of our jewelry artists are local to the Northwest, most in the Seattle area. This makes the temptation all that much worse when the artists meet with our lead buyer to flaunt their new wares. It’s all I can do not to claim every piece before it’s even ours to sell. Well, it looks like I need to get back to work. I’ll be back though. I am about a quarter of the way into my seventh year here at SAM and I have a lot to talk about, especially where the shops are concerned. I want to tell you all about my love of the Seattle Asian Art Museum shop and the pride I felt at the opening of the Olympic Sculpture Park. I’ll talk to you about new products and special events, oh, and the people! I have artists to tell you about and perhaps I can gossip with you about some of the staff here at the shop–they rock! But don’t take my word for it, come find out for yourself. Top photo: Shop and make a difference knowing proceeds benefit SAM educational programs.